Not long ago, David wrote a post in which he talked about how much he likes to get things done. And I can vouch that David is in fact a consummate do-er. A lot of the cool things related to Machine of Death have happened precisely because of his willingness to jump head first into projects, and Ryan and I have been happy to jump in behind and support him any way we can. I often like to think back to the moment, about four days after we hit #1 on Amazon, when David told us that our agent had negotiated a deal with PGW to distribute Machine of Death to bookstores across the US and Canada. “To do that, we just need to sign the contract and print enough books to stock all those stores,” David said. “So to fund that we’ll each need to immediately fork over A SUM OF MONEY THAT COULD EASILY BUY YOU A NEW CAR but it’ll be worth it in the long run!” It still staggers me that there were three guys on the planet who were willing to pony up the cash needed to make it happen without a second thought. Well, almost without a second thought. I admit that I did some quick calculations, literally on the back of an envelope that was (and still is) sitting on my desk, just to figure out how bad it would be if the whole thing went belly-up the day after I wrote the check. We’ve already sold ABOUT THIS MUCH, but won’t see any money until A LITTLE WHILE, and David wants me to pay HOW MUCH MORE? And, even if this works, we’re likely to get paid back A LONG TIME FROM NOW? Well, okay! I mean, it looked okay but it’s not like we had a business plan or anything. Business plans take too long to put together! Yet despite this, I’m not the same kind of do-er that David is. I’m a lot more comfortable planning, preparing, reflecting, and measuring than I am rushing into things. 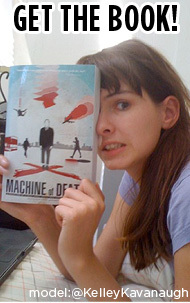 If it were left entirely up to me, Machine of Death would be one-tenth as awesome as it is today. On the other hand, I hope I have my uses too. At the end of last year, David handed me the electronic equivalent of a shoebox full of receipts, and I clicked around Wikipedia until I remembered enough about accounting to put them into some semblance of order. (We have a real bookkeeper who takes care of this now, thank goodness.) And for the past several months I’ve been tracking our sales, week-by-week, for all the various channels and formats that we’re available in. Over the past five months, we’ve amassed a pretty interesting data set — a tiny piece of which was already shared on this blog. I don’t know how actionable any of our data will be to anybody else since our sample is a single, uncommonly successful book. We’re not like most self-publishing writers since we do most of our sales in print — and a big chunk of those in bookstores. Meanwhile, we’re not really a small press either because we don’t have a calendar full of upcoming book releases. I have no reason to believe that any part of our experience is “normal” or easily repeatable by anybody else (or even by us). Today, I’ll just share you with a single graph that shows our print sales vs. our ebook sales, month-by-month, since we launched. I’ll be getting into more detail about both of those formats in the next few days , but you can see that so far about 70% of the books we sell are good old-fashioned blocks of paper glued between sheets of cardboard. One thing to note — partway through March, we dropped the price of our ebook to $5.99. As you can see, the split didn’t change much despite the drop in price, but it’ll be interesting to see if it does in the months to come. Personally, I don’t expect the price change alone to have much impact on what proportion of print books and ebooks we sell. For most readers, the choice doesn’t seem to hinge on a question of a few dollars of savings for one version or another. Instead, readers buy the version they prefer. Lowering the price on the ebook certainly generated publicity and a short-term bump in sales of ebooks. But publicity is publicity, and even talk about our ebook can (and does!) drive sales of the print edition. To be honest, it’s not terribly important to me whether I ever know enough about the big pot of gumbo called “industry averages” to be able to compare Machine of Death to any other numbers. It doesn’t really matter whether I find out we’re selling more ebooks than other folks, or fewer, or just the right amount. I mean, it might be interesting to know, but there’s not much we can do about it. The proportion of ebooks vs. print books is driven far more by consumer preference than by anything we have control over. I said before that we’re neither the typical “self-publisher” nor the typical small press. The best way I can put it is that we’re three guys who put out a book that lots of people have told us they really enjoy, and which we think lots more people would probably enjoy too. Our mission, as I see it, is two-pronged. First, to help new readers discover how great the stories in this book are. And second, to keep delivering cool stuff to the people who already know that. Right now, both print and ebooks (and both online retailers and brick-and-mortar bookstores) are helping us achieve both parts of our mission, so we’re going to keep investing in both of them for the foreseeable future. We don’t pretend to be prophets or even savvy industry observers, so we don’t know when (or if!) ebooks will make print books irrelevant. Right now, people are still buying and reading both in significant numbers. Luckily, we happen to think that both print books and ebooks are supremely cool when they’re done right. So all we care about is doing them right — putting the best content in the best possible package, whether it’s a trade paperback, a hardcover, an ebook, or a podcast. Heck, the podcast is a perfect example of how little we care about the outcome of any format war. Audiobooks account for a tiny sliver of the book market — something like 1% or 2% — but David has spent an enormous amount of his time and energy making our podcasts the best they can be. And then we give them away for free, because we just think it’s cool that they exist. (Yes, we hope new readers will discover us through the podcasts, but we also hope existing fans are enjoying them too!) If we really are witnessing the death of print books and bookstores, we’ll keep on producing print books for the same reason. Even if almost nobody wants to read them, we’ll still think it’s awesome to have them around, and that is totally good enough for us. So today, 30% of our sales are ebooks and 70% are print. I don’t know what this means for the industry, but it’s really interesting information for us. 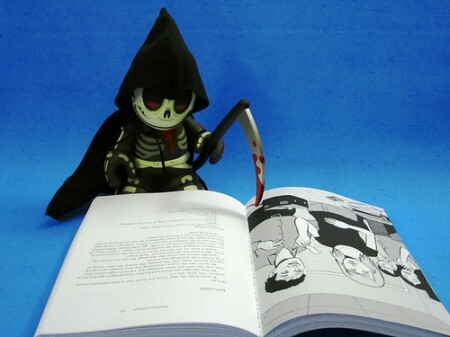 If you look at total sales for the entire lifetime of Machine of Death, ebooks actually appear much less significant. Overall, they only account for about 15% of total sales. This is because October and December (the months with the lowest proportion of ebook sales) were also the months in which we sold the most books total. So when print was winning, it was really really winning. Lifetime numbers are usually what I look at, so this month-to-month view was kind of an eye-opener to me. Print was a big part of our initial publicity push, but ebooks are clearly really important for our continuing mission. Almost one-third of new readers today encounter our book electronically. So the lesson for me is that even though the numbers don’t look that big yet, we can’t afford to look at our ebooks as second-tier products. They have to be able to delight our readers just as much as the print edition does! I know that “ebooks are more important to ongoing sales than expected” is not exactly the sexiest conclusion to come to. In fact, it’s downright small-minded and nerdy. No doubt it would be way cooler if I could spin some grandiose prediction from our sales figures so far. 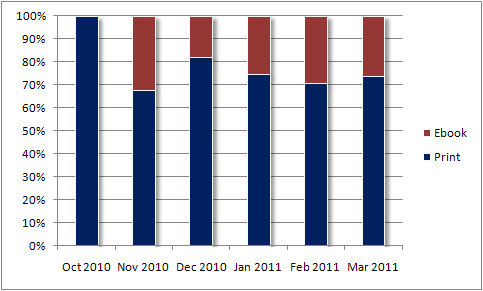 For instance, if I could identify some trend and use it to name a date when ebooks will surpass print books in sales. But even if I could do that, it wouldn’t help us do a better job. At best, it’s a distraction. At worst, it might encourage us to think of print as an already-cooling corpse, and that would be a huge disservice to thousands of our readers who still consider print alive and well. So, no big predictions here! Just a few numbers and some thoughts about what they might mean. If you’re not too disappointed, stay tuned and next time I’ll get into some more detail about our print sales. Can you make the tiny sliver of sales that corresponded to my (print) purchase in October a different color? I would like to feel special. Bright pink would work. I would have gotten the ebook, but we didn’t have a kindle yet, and it would have been harder for you to sign. I agree with this — but it also means the October numbers are artificially tilted towards print. Allowing early adopters to get the ebook version for free was very cool, so my purchase of “print copy” was really more “ebook copy + shelf decoration”. Matt sez: You’re right, Joshua! During the first week of sales, we asked people who would have normally preferred to buy an ebook to buy the print version instead. (Offering a free ebook as compensation.) But even so, only about 15% of people who bought the print book that week asked us for the free ebook. So even if you switch those people from “print” to “ebook”, it doesn’t change the overall number too much. Thanks for keeping me honest though!